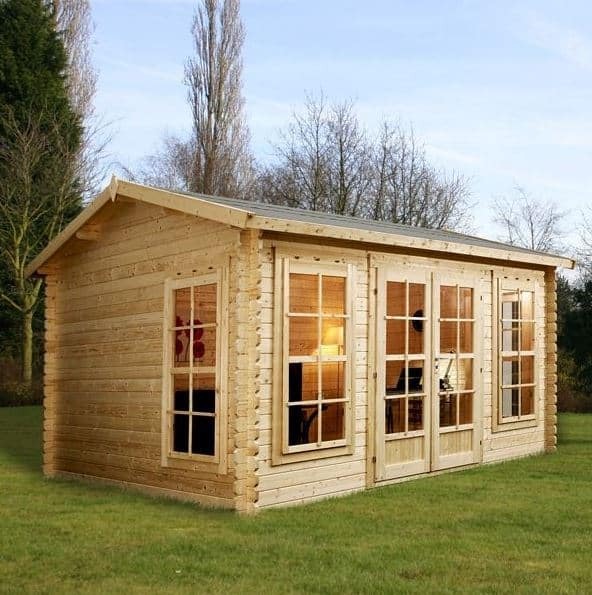 The 4m x 3m Home Office Director Log Cabin will give you a home office that dreams are made of. This luxury log cabin is spacious enough to hold all of your office furniture and equipment whilst providing fantastic views to the garden. 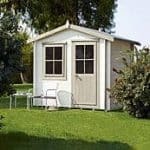 The home office director range of log cabins has been specifically designed to enable people to carry out business and office work effectively. This cabin is no different, and is striking due to the fact that the amount of light let in by the large windows and double doors is enough to make the place airy and spacious. The windows are on a hinge and are fully functional, opening to allow fresh air to circulate the building. The double glazed doors are on a sliding mechanism to full open up the log cabin to the garden, providing an inside-out feel during the warmer months. There is 28mm tongue and groove cladding around the whole structure for added protection against rot. Glazed windows and a lock system ensure that your home office materials and equipment are kept safe. Overall, this is a feature-filled garden building that is multi-purpose and can be styled to your requirements. We are aware that choosing a home office may be a difficult decision, particularly as this is a building that will most likely be used on an everyday basis and so has to be just right for your needs. In this section we discuss the log cabin’s many features, and how the cabin may be used in a variety of ways to become the home office that you have been dreaming of. Exterior: The cabin is constructed from high quality, FSC certified timber with 28mm tongue and groove cladding. Although supplied in a natural timber, the log cabin may be painted to add personalisation. With many different options for roof shingles and types of glazing, you can choose your preferred options during the purchase process to create a log cabin that suits your requirements. Interior: The 13x10ft log cabin interior offers a fantastic space in which you can create a home office that suits your working style and needs. 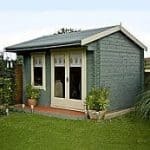 It is also worth noting that although we cite the primary usage as a home office, this garden building could be used for multiple purposes such as a summer house, hobby room or gym. Windows & Doors: With floor to ceiling windows and glazed double doors to the front and sides, an incredible amount of light fills the home office, providing a wonderful working environment. The doors run on a sliding mechanism, allowing you to open the log cabin up to the garden and providing uninterrupted views. Security: Due to the nature of the documents and equipment you may keep in your home office, we understand that security will be important to you. The log cabin comes complete with a lock and key to give you the peace of mind that your items will be secure whilst not in use. 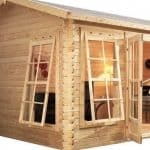 4m x 3m Home Office Director Log Cabin: How easy to build? If you are looking at the Director Log Cabin you may be overwhelmed thinking about assembly due to the sheer size of the building. For those with little DIY experience, fear not, as the assembly process is laid out to be as straight-forward as possible with the comprehensive set of instructions. A step-by-step guide and easy-to-follow diagrams will keep you on the right track. Your package will contain everything needed for assembly; timber panels, roofing, glazing, fixtures and fittings are all included. It is recommended that two people assemble the log cabin for safety reasons and due to the size and weight of the parts. Please note that a professional home installation service is available for an additional fee. 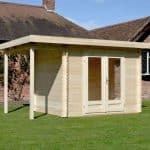 4m x 3m Home Office Director Log Cabin: What is the overall quality like? 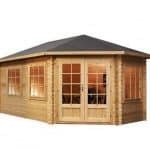 The home office log cabin gives a great first impression; a traditional style log cabin with a range of features that make it practical for purpose as a home office and an attractive building within your garden. The log cabin is constructed from 28mm tongue and groove cladding that interlocks to provide a sturdy and weatherproof structure. The floor also uses tongue and groove cladding, as does the roof with an additional heavy duty mineral felt covering for extra protection. The wood is FSC certified and the building as a whole comes complete with a 10-year anti-rot guarantee from the manufacturer. There are is the option of having different coloured shingles on the roof for an additional cost. Double and single glazing options are available for the large windows and doors, which can be chosen as you are going through the purchase process. Working from home no longer means a computer desk tucked away in the smallest, darkest room in the house. 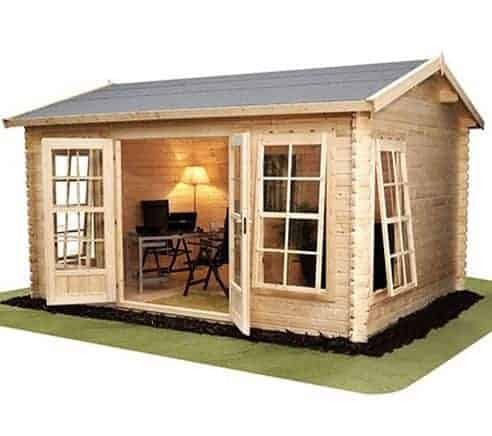 With the 4m x 3m Home Office Director Log Cabin you can enjoy a productive work environment within the relaxing surroundings of the garden. 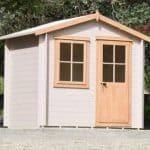 High quality construction and durability against weathering and the elements, means that this log cabin will be a useful addition to your garden for many years to come.